When the Spanish Civil War broke out in July 1936, neither side was equipped to fight a modern war, so they sought allies to deliver up-to-date materiel, including tanks and planes. The situation of the Nationalists was especially desperate. At this point, they were a group of generals who had organized a coup and who had lost any central command. Their main army, led by General Franco, was stranded in North Africa with little hope of being able to reach the mainland. Thanks to personal connections, Mussolini and Hitler came to Franco’s aid and airlifted the Spanish regulars across the Strait of Gibraltar. Mussolini’s motivations to intervene and help Franco were probably not out of kindness or to support a fellow fascist, but a show of strength and power and to give the impression that any crisis within the Mediterranean region was to be solved by Italy. All in all, Italian aid in Spain included 50,000 ‘volunteer’ troops, 758 planes, 155 tanks of the Carro Veloce L3/33 (CV-33) and L3/35 (CV-35) variants (including flame-thrower versions) and 8 Lancia IZ armored cars as part of the Corpo Truppe Volontarie (CTV). Their most notable action in the war was their defeat at the Battle of Guadalajara to a force largely made up of Italian members of the International Brigades. However, they were instrumental in the capture of Málaga and Santander. It was clear from the very first tank engagement around Seseña in 1936 that the Nationalists had no tank capable of facing the armament supplied by the USSR for the Republic. At Seseña, a company of T-26’s caused havoc among the poorly armed and armored Italian CV-33’s. Even tactics involving overwhelming them with numbers did not succeed, and the 45mm gun on the T-26 and the BA-6 made it impossible to engage at a close enough range for the 8mm machine-guns of the CV.33/35’s (Spanish designation for both the L3/33 and L3/35) or the 7.92 mm MG13 machine-guns of the Panzer I to do any harm. Two guns were considered – the German Flak 30 (which would later be the basis for the main armament of some Panzer II variants) which had a significant recoil, and the gas-operated Italian Breda M-35. Both guns had ammunition that weighed 147 grams and could penetrate 40mm of armor at 250m and a 90º angle. The latter gun was selected mainly because of its gas-operated reload and its fewer moving parts which would ease the modification and would allow the larger gun to fit inside the already cramped interior of the CV.33/35. The vehicle chosen for the conversion was one of the CVT and that, after the conversion and the tests, the vehicle was returned to the Italians who put it through more trials. This explains the two photos showing the vehicle with Italian markings and with Italian soldiers in the background. While it is not implausible to think that the two sides cooperated on the matter, neither side acknowledges any help from the other in designing the vehicle. Work on equipping the CV.33/35 with the Breda gun commenced at the beginning of the summer of 37. By mid-August, the blueprints had been completed and a tank and gun were requested from the CTV which were supplied almost immediately. The tank is referred to in Spanish-language literature as a ‘C.V. 35 IIº tipo’, which can be assumed to be an L3/35 (CV-35). The vehicle’s identification number was 2694. The modification would mean that the two parallel Fiat 35 machine-guns on the left frontal firing position were to be substituted by the individual 20mm Breda. Apart from that, no other substantial modification was to take place or was recorded. 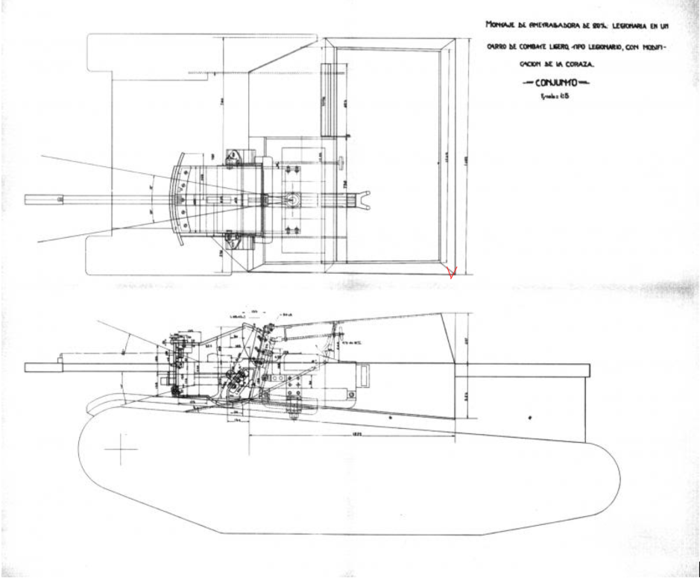 1:5 original blueprints of the modifications to fit the 20mm Breda gun – Molina Franco & Manrique García, p. 30. Whilst there is a lack of any empirical evidence, it can be assumed that the transformations of said vehicle would have been done in the Fábrica de Armas of Seville, which had been under Nationalist control from the very start of the war due to the actions of General Queipo de Llano. This assumption is based on the fact that captured T-26’s were sent to this city in Andalucía for repairs and the Panzer I ‘Breda’ modifications carried out during approximately the same time period were also done there. Prior to the capture of Bilbao in June 1937, Seville had been the main industrial hub for Franco’s side. The work was carried out by Spanish technicians, and according to Italian sources, supported by Italian artillery and technical service officers. Even before the modification was completed on August 10th, a request to the Italian delegation for a further 40 tanks and guns for transformation were made by order of the HQ of Generalissimo Franco. However, this order would not fully materialize; though it seems that some of the requested Breda guns were sent at that or a later time. Even so, Spanish tank historians Lucas Molina Franco and Jose Mª Manrique García, agree that this request for more tanks with the prototype yet to be finished was a bit hasty. Illustration of the Fiat CV.33/35 ‘Breda’, produced by Alexe Pavel, funded by our Patreon Campaign. The reason why the order did not materialize and that this modification was never mass produced or used on the field of battle was that an alternative was found. Halfway through the transformation, General Joaquín García Pallasar, an artillery officer and close friend of Franco, sent a report to Franco’s HQ recommending that the same modifications should be carried out on the German-supplied Panzer I. The request to the Italian delegations was consequently put on hold until the modification on the Panzer I had been done so it could be evaluated and compared to the Italian tank. On the 2nd of September, General Pallasar notified Lieutenant Colonel Barroso of the Estado Mayor del Generalissimo that the modifications on the CV-35 had been carried out and that it was ready to be shown to Franco if he had any interest. Franco was indeed interested and the vehicle was transported to his seat of government in Burgos. One of two known pictures of the CV-35 just after its transformation was complete alongside what are presumably factory workers – Molina Franco & Manrique García, p. 46. Later that month, the vehicle was taken to Bilbao, where it was enlisted and trialed against the Breda gun modification carried out on the Panzer I, during which the German vehicle proved to be slightly superior. One of the main advantages was that the Panzer I had a turret, whereas the Italian tank did not. It is perhaps important to remember that the Italian tanks did not have much of a reputation in Spain and were given the nicknames ‘lata de sardinas’ (sardine tin) because of their small cramped space and poor armor or ‘topolino’, the Italian name for Mickey Mouse. Even before the trials took place and probably in the knowledge that the Panzer I conversion would prove more satisfactory, the Italians requested the prototype to be given back on the September 1st with a second order for the return of spare Breda 20mm guns on the December 9th. 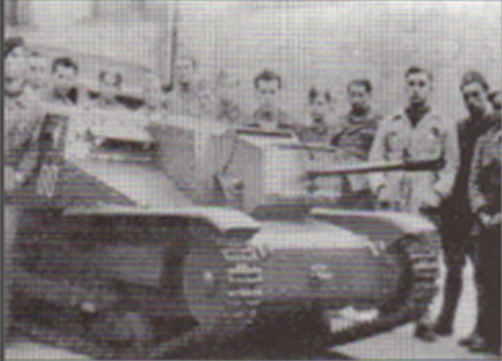 Once it was given back, presumably in late September or October, the tank was assigned to the Reggruppmaneto Carristi where it was subject to more trials. The conclusions were not positive and three main flaws were found: 1. the increase in the gun’s size within the hull made it uncomfortable for the commander/gunner; 2. the left side visibility of the driver was limited by the increased length of the gun; and 3. There was an imbalance in the vehicle with the left side now weighing 200kg more than the right. 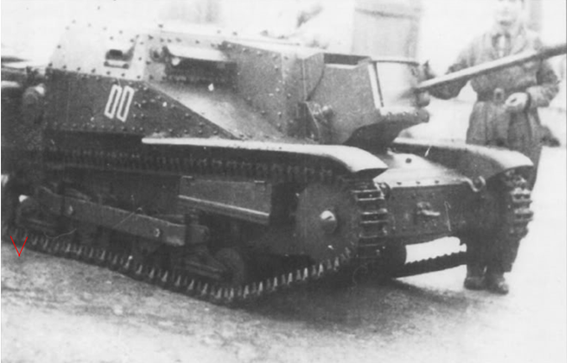 With this in mind, the Italians did not adopt this conversion and the final fate of this prototype is unknown. After being trialed, it followed operations first at Rudilla (Teruel) on the 9th of March 1938, and later at Tortosa (Tarragona) on the 19th of April in the aftermath of the bloody battle of Teruel and the build-up to the Aragón Offensive. The other known photo of this modification, presumably taken at the same time as the other. This photo shows Italian troops in the background, denoting that Italy had some role in the modification. Photo: SOURCE. Despite the failure of this tank, it is a fair assessment to say it influenced the development of other tanks. The aforementioned Panzer I ‘Breda’ was a direct successor of this tank and 4 were converted and saw action, though this project faced problems of its own. Furthermore, Italian Army records of the period talk about another modification with the 20mm Breda, this time mounted on top of a CV.33/35 in an improvised ‘rotary top similar to the Panzer I’. This may well be referring to the CCI tipo 1937, which was heavily based upon the CV.33/35 and was equipped with that same gun. Direct correlation with the WWII-era CV-35 20mm gun conversion undertaken by the Italians in North Africa is harder to prove and seem highly unlikely. This field conversion consisted of equipping the Solothurn 20 mm Anti-Tank rifle to enable it to counter the lightest Allied vehicles. Initially, the gun was mounted at the top but it was moved into the hull. Unlike the Breda gun, the Solothurn rifle was heavy and had a considerable recoil. The photos of the CV-35 ‘Breda’ show some interesting markings on the side of the hull. These are two white empty parallelograms which do not match up to any of the common markings of these tanks in the Spanish Civil War. However, this is because they are Italian tactical markings that correspond to the 2nd vehicle of the 2nd platoon, 2nd Squadron.